What is the abbreviation for Knowledge-based, Accurate Natural-language Translation? A: What does KANT stand for? KANT stands for "Knowledge-based, Accurate Natural-language Translation". A: How to abbreviate "Knowledge-based, Accurate Natural-language Translation"? 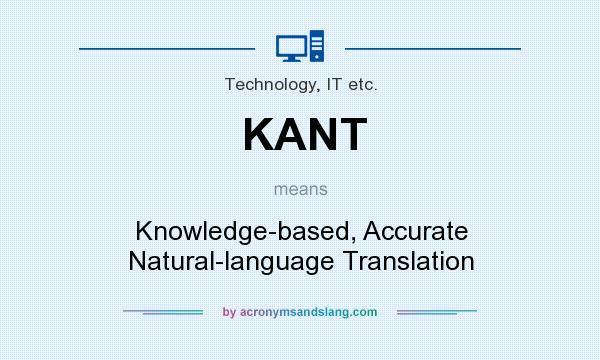 "Knowledge-based, Accurate Natural-language Translation" can be abbreviated as KANT. A: What is the meaning of KANT abbreviation? The meaning of KANT abbreviation is "Knowledge-based, Accurate Natural-language Translation". A: What is KANT abbreviation? One of the definitions of KANT is "Knowledge-based, Accurate Natural-language Translation". A: What does KANT mean? KANT as abbreviation means "Knowledge-based, Accurate Natural-language Translation". A: What is shorthand of Knowledge-based, Accurate Natural-language Translation? The most common shorthand of "Knowledge-based, Accurate Natural-language Translation" is KANT. You can also look at abbreviations and acronyms with word KANT in term.